If you’ve ever paper scrapped, you’ve probably followed a sketch of a layout in order to create your own layout. In digital scrapbooking, these sketches are called templates. 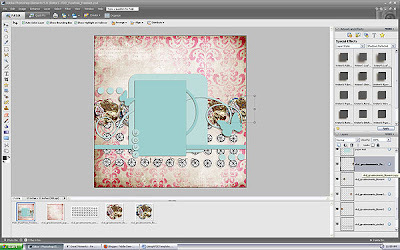 A digital scrapbooking template is made up of layers of different shapes that give you suggestions for placement of your papers, elements and photos ~ similar to a puzzle. 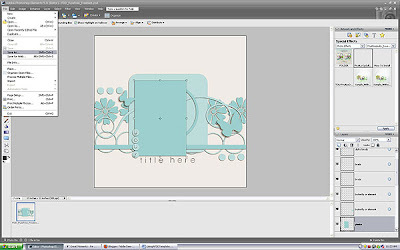 In this tutorial, I’m going to give you some instructions for using a Fiddle-Dee-Dee Designs layered template in Photoshop Elements 5.0. You’ll need to start by choosing one of my templates from a template pack of your choice. First, open the template in PSE. Go to File > Save As (Shift+Ctrl+S) and save the template with a new file name. Your original template will be safe from any changes you make so you can use it again and again! 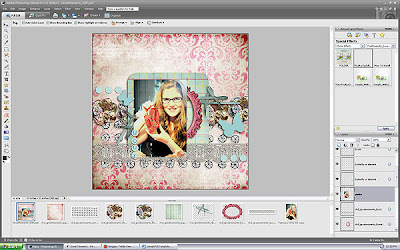 When I use templates, sometimes I start with photo placement, and other times I start with the background paper or an element. 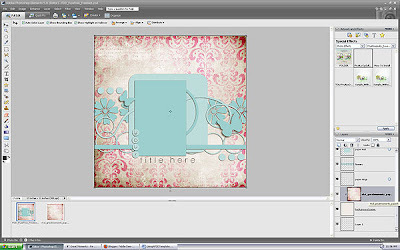 It really does not matter where you start using the template. 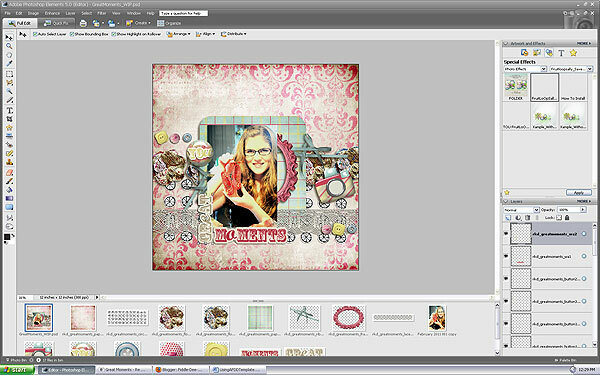 For purposes of this tutorial, I'm going to be starting with the bottom layer, the background paper layer. On the right side of your screen in PSE, you'll see your layers palette and each individual layer will be named. 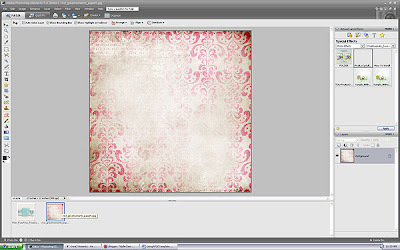 Select the one labeled "background paper." Once you select it, in the main screen you will see the canvas has a dotted line around it with squares at each corner. Choose your background paper and open it in PSE. Drag your paper onto your template canvas right above the layer labeled "background paper." With the paper as your active layer, use Ctrl+G to clip your paper to the background paper layer. Then use Ctrl+E to merge the photo and template layer. Now move the next layer above the one labeled "background paper." 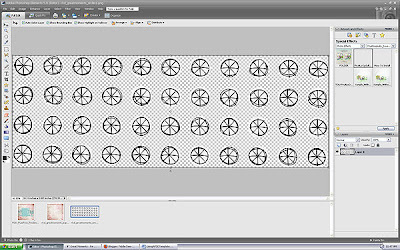 This layer is labeled "paper rings." At this point, you can choose another paper and follow the steps above to clip and merge the paper of your choice the paper rings shape. 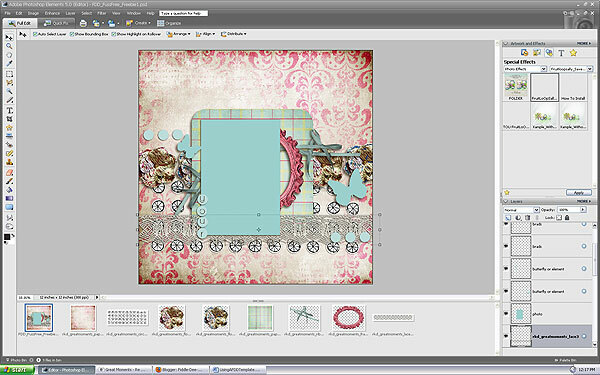 However, I'm using this template as a guide and I'm going to choose an element from my kit to place here. You'll see the the paper rings layer is highlighted in the layers palette on the right. Here you'll see that I've brought in the element of my choice into PSE. As before, I'll drag this element onto the template canvas. 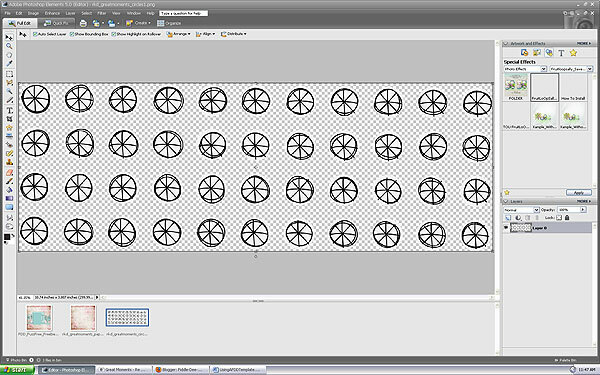 It will be right above the layer labeled "paper rings." When I drag the element in, it is placed in the center of the template canvas. 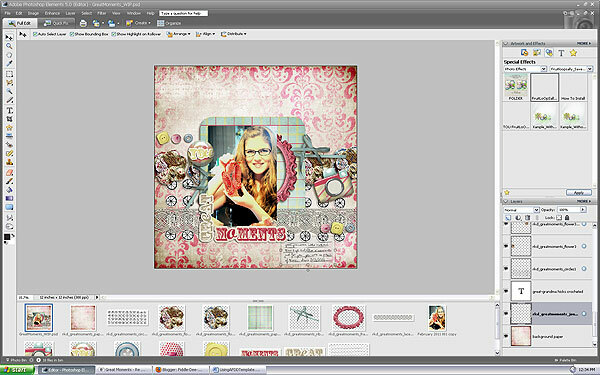 I'm going to move it down so that it is placed above the paper rings image. Since I'm now done with the paper rings layer, I'm going to make sure it is selected and then I'm going to delete it. I'm going to continue working my way up the template, using each layer as a guide for element placement. Again, you can choose to clip paper to any of these shapes, but it's my personal preference not to use the shapes and instead use elements from the kit I've chosen. The next layer is labeled "flowers." I've picked a couple of flower elements to place above this layer and once I've pulled the flowers in above my "flowers" layer and moved then over the flower shapes, I've deleted that layer. The next layer is the one labeled "paper mat." 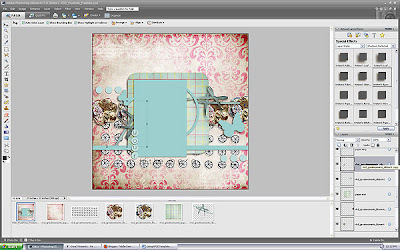 For this element, I do want to clip paper to it, so following the steps above, I've picked my paper, pulled it into PSE and onto my template canvas and then used Ctrl+G/Ctrl+E to clip and merge my paper to the paper mat. The next two layers up are labeled "string." Now, in the particular kit I'm using, there aren't any strings. That's OK. I'm going to choose a curled ribbon element instead to place above those layers. 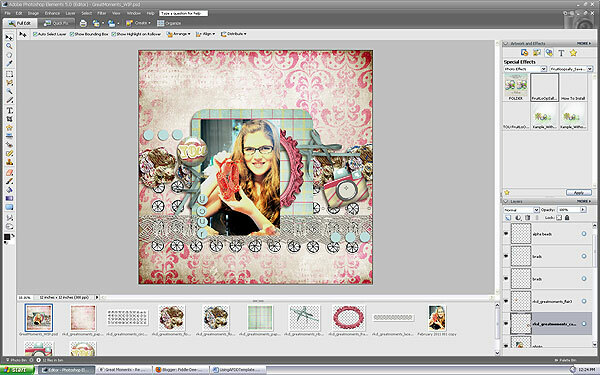 Remember that the layers are suggestions of what you should place on your layout. They aren't meant to limit your choices, but help you start thinking about what elements might look good placed in that particular location. Below you'll see where I've added the ribbons and deleted the string layers. The next layer is labeled "paper ring." 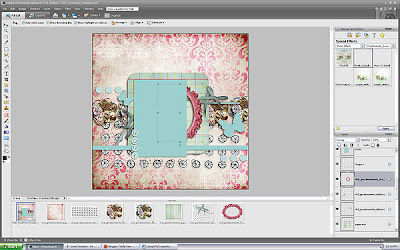 I'm choosing to place a cool ornate frame there instead of clipping paper to the shape. Again, this is my choice. Feel free to clip paper to the shape (Ctrl+G/Ctrl+E) and use the ring. Below you'll see where I've placed the element and deleted the "paper ring" layer. Now I'm just going to give you a series of screen shots showing you each element as I pull it into the template canvas. 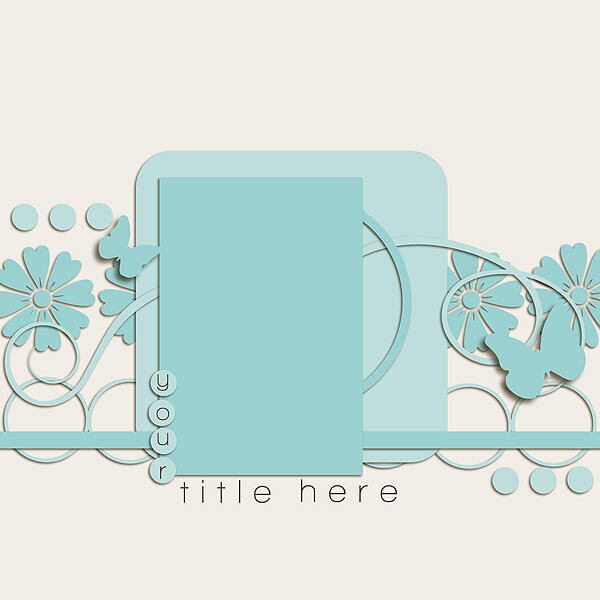 I've added a journaling element that was not part of the template design because I have a little something I want to say about this photo. And I'm finished. No. Wait, I'm not. I want to add something else. 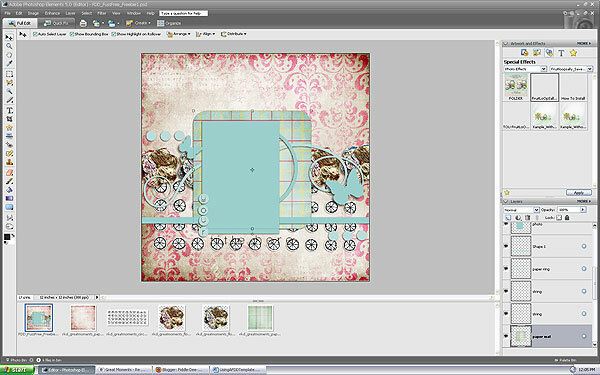 And that is perfect, because even though I've used a template, I can choose to add or remove elements to make the layout fit my style. I've picked a couple of branches to add around my flowers. 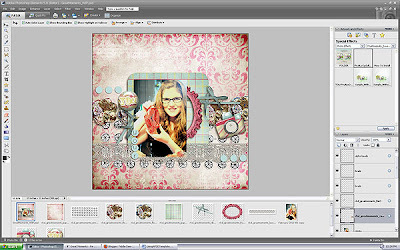 I hope this tutorial was of use to you and help you enjoy using templates even more! 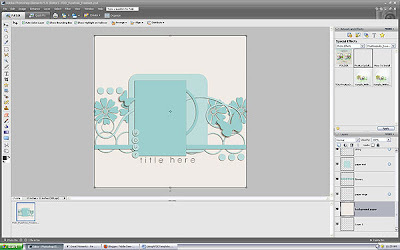 Great tutorial - thank you very much! Thank you! I'm new to digital scrapping - and your tutorial is quite helpful!